The pattern for creating lillies spanned the page. From Dennison’s 1917 Art and Decoration in Crepe and Tissue Paper. Companies like Dennison instructed consumers about the aesthetics of crepe paper. Instructions noted that the goal of using crepe in crafts was not in the finer details, but in the complete visual tableau. 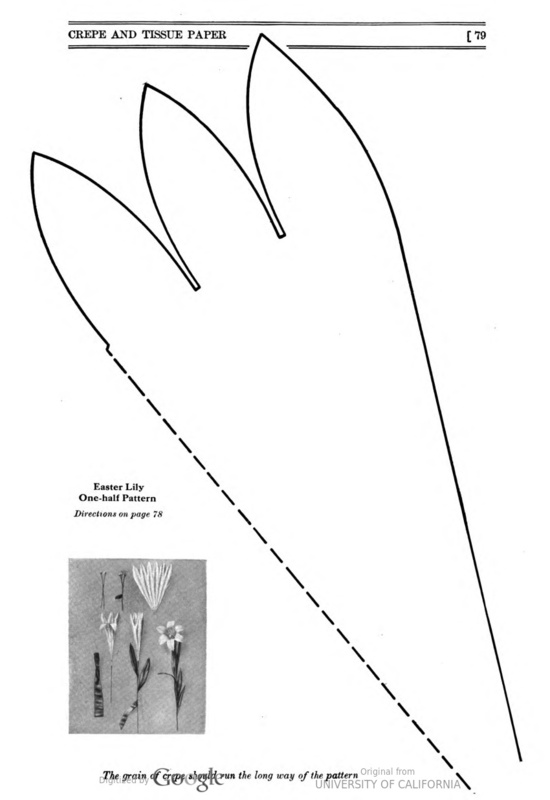 In a 1917 example of flower making instructions, company authors suggested copying details from life, or real cut flowers. If those were unavailable, crafters could “trace the patterns” to tissue paper. The domestic arts of home sewing, embroidery, and even flower arrangement required a certain attention to detail that was pushed aside with crepe paper. This cuteness at times translated as cloying, as when crepe flowers “added a gay, colorful note” to the entryway of a home. Crafters understood that, despite crepe paper’s ability to hold folds and twists, a certain homemade charm was associated with it. Instructions for crepe paper also encouraged the fantasy world that surrounded it. Their images suggested a different kind of project that was fantastical. Hand-drawn illustrations showed a fully crepe-papered world. Starting in the 1890s, magazines showed an imagined, ideal home of fully draped dressing tables and lampshades with elaborate decorations. They depicted what to our eyes seems an excessive quantity of crepe in every imaginable corner of a home. Even as magazines and other print culture began to utilize photographs by the end of the 1910s, hand-drawn illustrations of crepe creations implied that fun and crepe were interchangeable and that excess was associated with this disposable consumer pleasure. When photographs appeared in print, they tended to show professionally made costumes or extravagant examples submitted by readers of the Dennison Party Magazine. 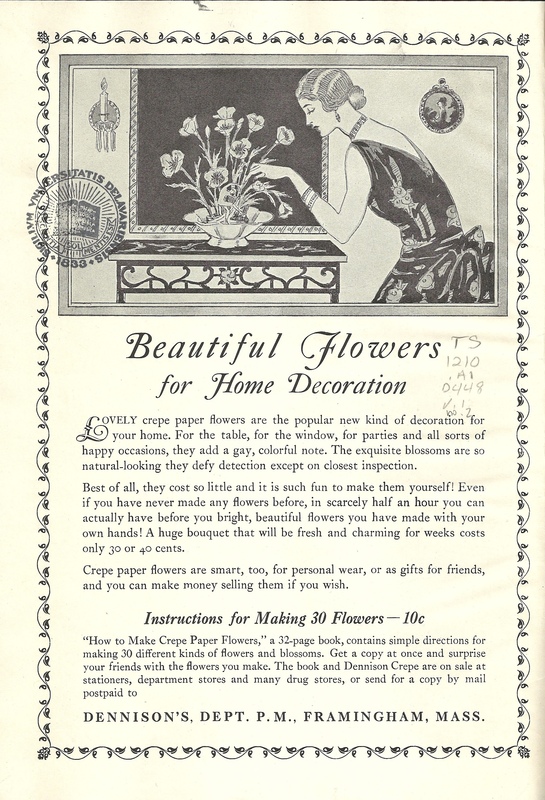 Dennison Party Magazine showed that “beautiful flowers” would enhance your home, 1927. Dennison taught consumers that crepe paper’s aesthetic was associated with completed projects. Party favors were sentimental because they were recognizable objects like flowers, a connection to a social event, and a reminder of the fun party. Conversely, the large rolls of crepe paper that taste makers suggested for covering walls and ceilings were aesthetically blank. They had no finished form, and therefore held no imbued meaning. Crepe paper relied upon completed forms that were not precise: the material was almost anti-modern in its lack of precision in design. However, the availability of crepe paper and its low-cost meant that it was the perfect material for decorating in the Roaring Twenties. Dennison Manufacturing Company, crepe paper advertisement, Dennison Party Magazine 1, no 2, 1927, front cover.